I can still remember the bowl all steamy placed in front of me while I sat at someone else's table. I was in high school and I sang in a choir that traveled around Western Canada and down into Montana, and it was in this house on the prairies that I had been placed overnight and come morning, we all gathered around that farm table. "While you are filling your bodies with physical food, I am going to give you your spiritual food for the day." I remember trying not to laugh - it sounded so ludicrous, and for how many years, I continued to feel the same way. The Words of God are Words of Life and the only way to keep a soul from shriveling up and drying out is to fill your life up with them. But like Simon Peter, the loud-mouth rock the church would be built on, I don't want to run from His truth. I don't want to run from His Holiness that exposes me, because the depth of His Grace and Love is exposed there too. To Whom shall I go? To the Only One Who has the Words of Life that have saved me and made me His. The world can spin in dizzying speeds and I can look at the climate around me and it becomes hard to breathe. I can hear the words of government leaders and watch votes be cast and the cheering on one side wars with the screaming of the other and there aren't enough ear plugs to drown out the noise and I look at the innocence of my children and my soul trembles with the fear of all the unknowns that surround them. Presidents and Kings hold power and weight in the heady thrill of their position and we bob in the wake of their decisions. But there is a Ruler, above all rulers, Who holds the hearts of kings in His Hands. And because that station is so far removed from my own, because I will never be found in a position to control any government official, it becomes an easy thought to believe and cling to. Until He brings the thought near and close to home. Until the status quo of my own small existence is interrupted and my illusion of control is shaken and suddenly, what is truly in my heart rises to the surface. He stands as a faithful witness to my moments and my days - no matter how small; no matter how insignificant. what quietly becomes idolized in my heart. Instead of relying on Him and His calling on my life, I begin to find worth and definition in what I think I can control. But He is ruler above all rulers - and that includes even me. And in those words, He began to pry the tight hold of control they had on their lives. Because all authority had been given to Him, they could go. They could go and do the impossible. They could go and preach His Gospel. They could go and make disciples. They could go and let go of their lives to die only to find Him Faithful to His promise to always be with them. He is the Ruler over all rulers. He is the faithful witness to our relinquishing. He is the firstborn from the dead and the ruler over the kings of the earth - all because of His love for His creation, for those Who He has washed clean from their sins with His very own blood. You allow the ground below my feet to move at times, I think. When I begin to find more comfort in my life than I am finding in You, You reach through to shake things up a bit. You reveal what is deep in my heart and You cause it to rise to the surface and You show me the fallible things that I am building my life on. And unless a life is built on You, unless that foundation is You, the kingdom I build will crumble and fall. You are the Ruler above all other rulers from the greatest to the smallest and You won't share that place with any other. So I give you open hands and surrender the hold I never really had on a life that is Your own anyways. My life is Yours because You are Faithful and True and no matter what happens tomorrow or in 10,000 tomorrows, You allow it for Your glory and I choose to trust in Your Hand. Jesus moved through the cities and villages - no place was too big or too small for Him - and He taught there and He spoke the gospel there, and He healed every sickness and every disease that was laid open and oozing in front of Him there. "...because they were weary and scattered. The baby was in my arms when I first sat down this afternoon, with these verses in front of my face. I rocked her softly while I read of the weariness and scattering and of the God-Heart that ached for His lost ones. It didn't take much of an imagination to picture shoulders sagging and weary and panicked eyes and bodies racing to find any footing of security. How intimately I know that my frantic pressing in for healing of the broken places is really a pressing in to be filled by Him. 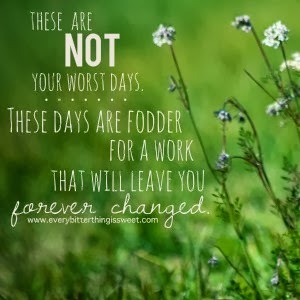 His whole plan was to put on our dust - this dust that grows so tired with the hungering and thirsting and the Creator drew near to His created and walked among them and was moved with compassion because the weight of our dust weighed heavily on Him. Our fear and our spinning reaches His ear like the bleating of lost-crazed sheep and His heart is moved by His children who become weary with their striving. He speaks and He heals and His Spirit is among us, but more than anything I wonder if He longs for our tired and broken places to be filled with His gospel truth - that we would recognize the life our wandering souls will find in the shadow of the true Shepherd. The clamoring and the search for wholeness and healing hasn't stopped - if bookstore shelves are any indication, the need for the Savior's touch has only grown heavier. It becomes so easy to turn inward - to see all that mars us, when the reality is, lifting my eyes beyond myself and my brokenness to see the weariness and disorientation of the those around me begins to synchronize the beat of my heart with His Own. Adoring Jesus is not about me, but ultimately, it is for His glory. Any need found gaping in my life can only be fully met and bound up in Him - so get it filled full with Jesus so that it is His Joy that is seen rather than my desperation and neediness that causes me to reach out and make those around me into gods. This life isn't about me - and it never was. It is only Jesus - only Him. This wrestling through the days - wrestling with the sin nature that runs deep and wrestling through the moments He uses to change this heart - it is all to cause this daughter to reflect her Father and when eyes are lifted off of my dust onto the dust of the created-ones He loves, I am moved with compassion; I am moved from just longing to come alongside the ones who are lost to the action of helping to guide them into the arms of the Good Shepherd. You came so near - in a stable, in the synagogues, at the wedding, on the road, the field and the cross. You drew near after death had been conquered and in Your Holiness and perfection You still allowed Your heart to be moved by the state of Your people. You watch when I spin panicked and dizzy - searching for anything to fill this gape that only You can satisfy. Your eyes never leave your creation and Your prayers for me reach the very ears of God and the compassion that moves Your very heart begins to stretch my own and Your longing for Your lost ones becomes my longing too. God Who is Moved by Compassion, in Your grace You begin to move me too and a heart that was hard and bitter begins to break soft and tender under Your love and mercy. It's after the oldest girl and the only boy tie on shoes and wet my face with sloppy kisses and yell their good-byes as they pile in the car with their Daddy. It's after the feverish and restless baby girl is laid down in her crib and tucked in with a kiss as she rolls over with a sleepy sigh and begins to breathe sleep. It's after the afternoon coffee and the chapter of Frog and Toad and her warm and sleepy head rests near mine that Olivia pulls my arm tight around her middle. Just hold me here like this, Mama, she whispers as we settle into a sagging couch and wrap warm blankets around us and let the flickering screen lull us both to sleep. It's after all of this, as the cooling fall air moves through open windows that I realize that He has taken my expectations and turned them upside down. Before that first contraction and that final push that ushered in the second day of this new year, I sat full and round and stretched thin and the naming seemed fitting for the coming days ahead - I sat expectant, of a baby, of her cry and of all the unknown days ahead. I felt full of expectation of Him as well - full of the wondering of all He would do and how I would stand witness. They say that expectations kill relationships, but I would like to beg to differ. 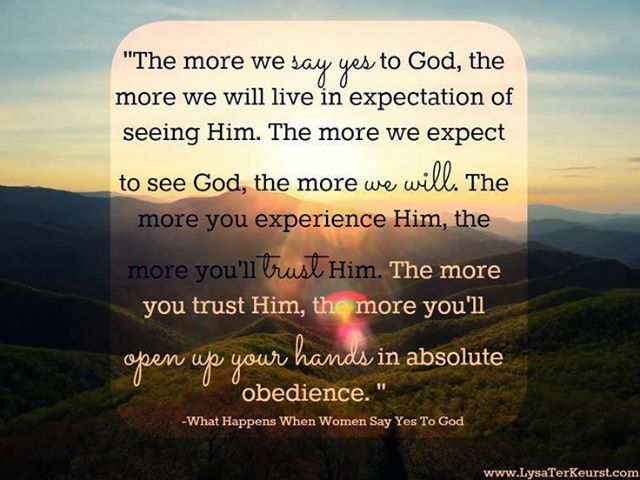 Expectations can heighten the senses, can deepen the search when they are placed on the very Person of God. I have wanted to know Him deeper, in more intimate ways as we have sensed His Spirit moving and leading to places we don't always understand or comprehend - I have become expectant to see Him and His Hand in all things and He has not disappointed, even when I have disappointed myself. The week before this one I had sat with a group of women and listened as we were encouraged to ask God to renew our minds - to expectantly wait for Him to change old patterns and replace them with Him. I couldn't even imagine - it seemed like a fairly big task, even for an infinitely big God to do in just one week. I had mentioned, to this group of women, of a little girl who lives next door, who likes to sit on my front step and quietly pit my oldest daughter against my second - as though watching them fracture gives her great pleasure and I asked these ladies to pray for me. I come from deep fractures and I don't know how to raise a family without them and the helplessness I feel as I watch my daughters war with each other leaves me cold and afraid. I have an aunty and uncle who live in the cold and far north of Canada and despite my fracturing they have loved us and make that long, long drive down to us when they can and my children who have lost so much have gained so much because of them. Before the good-byes and the we'll see each other soon's, my aunt brought in a box of carefully selected gifts - ones that they knew would reach the hearts of my children to let them know of how special they are. For my girls, it was a plethora of melty-beads. This morning I stood in the kitchen while my girls sat around the table working on placing beads on little plastic trays and arranging them perfectly just so. Olivia, unusually quiet, mentioned that she was making something special for one of her friends down at Madison House and would I please iron it quickly when she had finished. I took the little tray in my hand and carefully placed the paper over top and ran the hot iron over it until each bead melted together and the heart that she had created was whole. And it was then, after the others had left and the smallest was sleeping and she wrapped my arm around her middle that she placed that melted little heart in my hand. It's for you, Mama. I made you some love and I want you to have it because it's yours. It was in that moment that a portion of renewal came - when my eyes were opened to how my expectations were so limited in the face of a limitless God. He takes my pieces, my fracturing, my life that I view as broken and He takes it and He alone makes it whole. He takes a uncle and an aunt and woman who was and still is a sister, and a cousin and a niece and nephew and He takes them all and He redeems what has been so ugly. He allows me to see where my definition of love fails deeply and where my expectations don't expect enough and He lifts my eyes to see how He, through His very Son redefines the very definition of love. His Love covers every fracture and shattered place because of His body that was fractured and shattered for our very salvation. His Love redefines our very lives and calls us out of the dark and broken places as whole and healthy in Him. My definition of love is so limited, so small, so broken. I love how I want to be loved and I miss the mark over and over again - until You open my eyes to see how You Love and how this Very Love can seep in through all the broken places in me and I become a conduit for Your Love. That You don't just come near to me, but that You actually abide in me when I love Your love towards those around me is almost too big to comprehend. You have loved first, You pursued first, You reached out and provided the Way to fix all the fractures and shatterings that cut deep inside first so that I can love as You Love in return. You have redeemed before my mind has even comprehended and I am in awe of Who You are. Daily Adoring: God Who Lives in Me. There are some days when the loudness and the friction between personalities in this house make me want to run for those hills that surround us and try and hide somewhere on the other side. they are already back to bickering and fighting. Hiding under the table is acceptable for a mama to do, right? Zeruiah burns hot with a fever and Elias decides his school book needs a bath and Olivia sneaks that picture book onto her lap and Lyla alerts me to the fact and I tell you, I could just lose my mind and I really don't think they would even notice. And we are half way through our school work when I stop it all and just look at them as I pull out a story book I had been saving for just the right moment when work was all done and they were playing all quietly. But it just wasn't going to happen so I might as well make the moment right and instead of drilling the 18th subtraction problem that she already understood, we piled on top of each other in that Starbucks chair that still smells like coffee and I begin to read of the Gnome from Nome. And that's all we needed. All we needed to begin again. I read this morning of the Jesus who welcomed small children despite the disciples protests, of the Man who gathered them close regularly to bless them. I thought of their mamas who brought them near to the One Who delighted in the small ones He had thought of before they ever were. This same Jesus - His Spirit lives in me and it fills me with His love and His joy for the children He's given. And so when I'm weary and I'm ready to run away and hide-away, He reminds me - He is here with me and through my loving, they will, I pray, come to know His Love is true. When the day becomes stormy and I feel like I have nothing left to give, no energy to do the next thing needed, let me remember, Lord Jesus, that You are in me. That my soul is now Your home - that my body is Your Temple and You, Who took on dusty skin for 33 years, has made the deepest places in me holy. You live in me and Your Life is now my own and You ask me to die so that I can find Life and it's in the dying that I really do begin to live. You are holy and good and Your love transforms - let it transform these lives within our four walls as we learn to love like You. It was in the middle of her sitting in front of the book with that paragraph full of sentences and that one little word. It was at that moment that she decided that it was time to exercise that strong will and claim that she had never seen it before, nor would she ever know what it said. 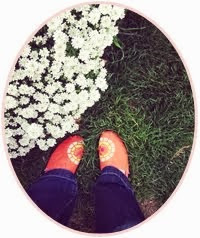 Each foot step, each lap, each creak escaping below my feet held a prayer for help. For guidance. "Can I be your village?" A little girl fell yesterday, riding circles with her bike and somehow in whatever way, the tires slipped out beneath her. I was coming down the stairs as she was being led up and that sweet little face - trying so hard to be brave. Trying so hard not to cry. Maybe that is what breaks my heart the most - the bravery that is worn by the very youngest of them all. I got her into the kitchen, Zeruiah was distracted, and I found the band-aids and the peroxide to help clean up the bloody wound and even when it hurt and the one tear rolled down, she never. cried. once. By the end I had her giggling and soon her eyes were clear and the smile was back on and I've only met her mama through smiles exchanged in the picking up of her children, but in the small and simple ways of cleaning up scrapes and asking about school I'm being part of a village needed. Wherever you are, you are needed. And those needed places will probably call you outside any comfort zone you may want to hide behind. That first step is always the hardest - because sometimes the places you go may seem to be the hardest, may not always seem to be the safest, and in our North American culture, building a life of safety and comfort is the highest end goal. as those who have made the decision to follow Him and to love Him and to give the rest of our lives to Him, that also means to follow Him to the dark places, to love Him through loving those who may resist at first, and to give our lives to Him - whatever that means. It means giving up comfort, letting go of safety and letting Him be glorified through your emptied out life. It is not an easy life we are called to. The comfort we build here will vanish like the mist that we are. We are called to be radical and to be different and to give of ourselves the way that Jesus gave all for us. You are needed to be a mama's voice when a mama can't be there. You are called to be a daddy's voice of wisdom when a father has chosen to walk away. You are called to be a sister, a brother, a friend, an ear to the ones across the tracks or the ones across the street who are broken and hurting and in desperate need for the Light to give hope in the dark. You are needed to be a living sacrifice - to offer your whole self to Jesus and to go where He leads - and where He leads may be to the very heart of a child who needs to see Christ's love for them in your actions and words; and by offering up your life, you may be a saving grace in their own. Wherever you are, He can use you. It comes in the middle of driving through raindrops and lightening flashes. As my baby girl babbles in the back seat under the flashing street lamps, the message comes through. The voice on the other side of the radio tells of the woman who knelt before the feet of the Savior and she let her hair fall onto the dusty floor and wept as it blanketed His feet. In the midst of men who were horrified and maybe a servant or two who would speculate later among themselves, she poured out what she had for Him and Him alone. He forgave lavishly and she responded extravagantly. Like a tongue twister that gets muddled up between all the s's and w's and th's. As though a mouth has grown slow and a tongue thick and what is written plainly in front of you somehow falls apart. out of the messy and the broken of what she laid before Him, intense and penetrating beauty filled the air around her, around Him and her adoration, however clumsy, however extreme, ministered to the very heart of God. The natural language of the tongue does not lean towards the holy. The sin stain is buried deep. and it is there, in the messy, in the imperfect that He asks me to come. To close my ears to the voices around me and to open my eyes to Him alone - to let the pouring out empty myself of me and spill out onto the holiness of Him and somehow, incredibly, my feeble and awkward attempts actually minister to very heart of God. it draws His heart to me. It's the end of the day and the beginning of September and the spiders have grown large and they are searching out places to hide. Almost nightly now there are voices, tight with panic, that call out to their daddy asking for his bravery that stands larger than their fear. There are nights that he's tired and a slight sigh escapes, but he is moved by the voices of his daughters - he understands that they are scared and he lends his strength to calm their fear. This past summer has done a number on my heart - or maybe it's been me that's done the number. I didn't realize it until a drive home last evening when he opened the door to my feelings and what poured out was pain-filled and broken. There comes a point when either you have messed up or someone else has and in order to distance yourself from pain like that again, you begin to close down small parts of your heart. It seems harmless, really. Protects you and them, right? But closing off your heart to those around you has the grave potential of shutting down your heart towards Jesus and that, that is when those closed off places begin to atrophy and harden. With no blood flow - extremities die and without His love flow, my soul began to curl inward and I didn't even realize it. Death can happen so slowly. And all it takes to breathe again is to open your mouth and say that one, small word. And He hears. He hears, and He responds. A Father moved by the voice of his daughter and He comes near and He breathes life into broken dust and there is hope. The smallest prayer can actually become the largest one because when a heart lays bare, His strength becomes all and Hope shines brightest in that moment. He hears it all - the small and the large and the stone is made soft once again. It's Sunday and this space is supposed to sit quiet, but I've been quiet these last few days and it's a brand new month. A brand new month and the edges of the sun were burnished in fall-ish gold this morning and so why not sit in front of a screen to give Him glory? We walked down the path to feed the ducks this afternoon, to sit in front of still water and watch the minnows swirl and the crawdads do their slow water dance across a muddy pond floor, hidden in shadow but appearing in the sun-patches and the delight of my children was loud and rambunctious. I grumbled this morning about the noise. About the never ending chaos that seems to surround our days. There is always a shout coming from somewhere, always an argument over something seemingly small. Zeruiah has begun to crawl with force and suddenly my sit-down and quiet moments are few and I can look ahead at the next three years with dread, or I can look at them with Jesus in view. The sky above me, that shows off different shades of blue throughout the day as though it were a jewel above me, is lifting my eyes to handiwork of my God. 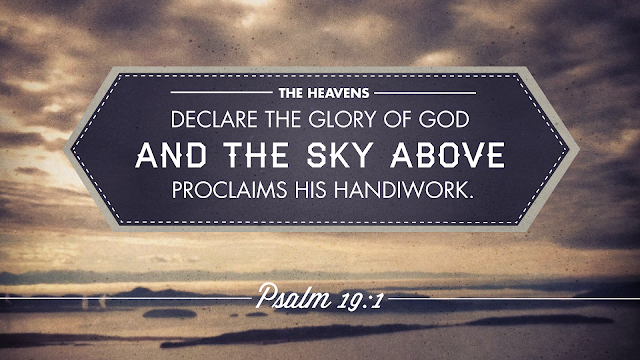 The heavens above, the ones that are vast and larger than anyone can explore completely can't contain His glory. And it all rests like a canopy over each one of us, it covers the six of us and as the sun makes its journey stretching shadows long on either side of our house, as our voices rise and fall and the minutes are filled with joy and chaos, His glory, His very presence is there. Their yelling and chaos can leave me depleted or it can send me searching out for the One Who gives rest to the weary. The loss of the sit-down moments of rest can leave me frustrated or it can open my eyes to the way that Jesus, in all of His holiness, bends down near to me to help me up. I have a choice. Can I choose Him over me? As summer fights to breathe out the last of its heat and autumn touches everything red and crimson and gold I am realizing it is all an echo of His glory that keeps the days spinning and our world moving and our lungs filling each day. God of all nature holds all of nature in His hand and my eyes search for Him and my soul is deeply filled. You are over the heavens above my head and You are closer than the air I breathe in. August ends and September begins and You are God over the time moving forward. All of nature heaves with Your glory and You let us be apart of it whether we choose to see You or not. Let me pause today, in the middle of it all to lift up my eyes to the skies You paint in brilliant shades to soak in the wonder of You.